iPhone is very close platform; so closed to an extent of file-phobic. iPhone platform is totalitarian. Files do not belong to an accessible file system and can exist only as Mail attachment. By contrast, Win and Mac computer platform is open and free, allowing the files and apps staying happily in the file system, viewable as icons. iPhone apps are using app centric approach. The iPod app is so, the Photo app so. The music and jpg picture – all the files are under tight management by the apps themselves. Essentially, every single app in iPhone is the a specialized Finder to manage all the data. The days you drag the icons to form a circle or happy face are long over. iPhone OS is a transparent read-only “Finder”. Attached files in Mail are displayed as such. A file is unreadable by the iPhone OS, staying as an attachment, displayed as an icon. If all files are well managed in their own way, what do we need a file manager (aka Finder) for ?! Logically, as iPhone apps become available in AppStore for sale, apps that edit Word files may be come available. With the ability to change files, the changes has to be saved. It is rather silly to continue store them as attachment in Mail. Although I knew people use email program to store files, but the majority wants to save their files in a space that they know where to find. Unless Apple like to rule with an iron fist that no editing tools or creativity apps like Photo editing softwere is allowed. They may not appear in the first wave, surely the iPhone Word or Photoshop version or alike will come. Word and Photoshop is not going to give up their way of doing things — saving files. The questions is how the files are managed. How to make a file available to more than one apps ? How to practically do it in a mobile platform, iPhone in particular ? iDisk is the new Finder! The iDisk automatically syncs and updates the files anywhere, pushing it to the iPhone. This is the trend and fit with MobileMe strategy – If your data can be synced via MobileMe, why shouldn’t your files be so? You files “beam” to your iPhone inside the iDisk. The shown files are displayed in either List or Icon view (left column, Figure 1), a change of the orientation switches to the Album view. A two-finger-tab creates new folder. A tab of icon opens the file (if you have an iPhone readable files or app to open it). One tab to open is like the double click action with mouse. Tab-hold or two-finger-hold moves the file. Double tabs “flip” the file over to show all the data such as date, size…. A search field to search files. The right column is a finger scrollable “dock” (I should patent this idea). Inside the dock the apps are displayed (right column, Figure 1,2). As iPhone became a full computing platform, one files can/will be used by many apps. For example, I have a JPG2000 file and want to make some edits in the iPhone Photoshop first and then drop it into the Photo apps for storage. Or, I took a picture in the iPhone cam and like to add some text and voice signiture before including it in a Word doc. These multiple steps actions are currently impossible. With advent of the editing apps like Word, it is required. The only purpose for the “dock” is to let you drop files to the apps. Let say you like to put some good photos into iPhone. Currently, we can either sync with computer or email it to yourself. With this speculative iPhone iDisk, you can put them in iDisk or have someone uploaded from MobleMe website. Here, you just tab-hold the picture file(s) and drop it onto the an app. 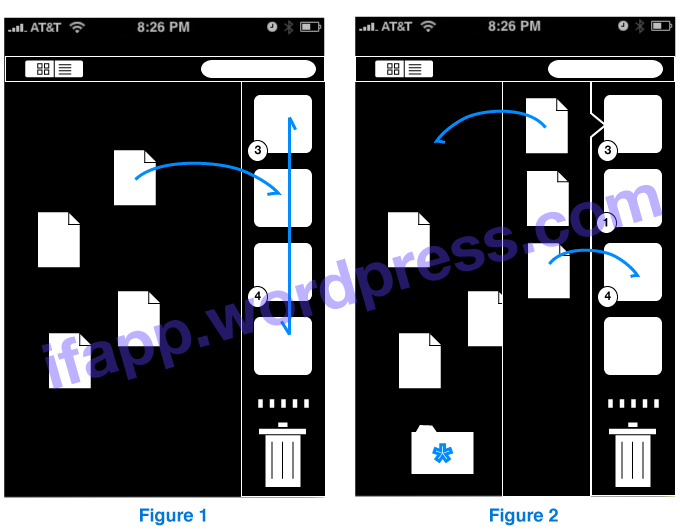 Once the file is dropped, if the app is a management app (like Photo apps), it will show the number of files that have been dropped (icons 2, right column, Figure 2). Should the app is editing app, the dropping of file will launch it immediately. Therefore, the same file can be used for the purpose of your choice. Similarly, once you finish editing a file, let say a Word doc. All files has been “saved” and managed by Words. In the iDisk, you see the app in the dock has number on the left hand bottom, it indicates the number of files held by the apps. Once the App is tabbed, the second column (middle column, Figure 2) appears and shows the files it possesses. This column is finger scrollable if files are more than the height of column allows. You may drop the file to iDisk for sharing. You may also drop it to another app for further edition. You use two-finger tabs the space (*), a new folder is created. Files can go to the trash, of course. Maybe, all these are unneccessary. I will tell you in the next post that an alternative method can be used without resolving into a full blown app like iDisk-Finder. Great analysis! I would like that to be the iDisk app, but it is slightly cluttered.